Foundation Ankizy Gasy was set up in December 2011 and built from our great fascination with Madagascar known as the Red Island. The name of our NGO in Malagasy means 'Children of Madagascar'. Our mission is to help Malagasy children in need. Having previous experience of working as volunteers in one of the children’s homes in Madagascar we wanted to keep helping local people in a small town where we used to live. We made it back in 2012 and since then we have been here to promote the idea of volunteering. We love having other people from around the world getting involved in helping our local community. Madagascar is one of the poorest countries in the world where 80% of the population lives in extreme poverty and more than 60% is illiterate! We aim to give Malagasy children a chance to have a better future. We believe that every child has the right to have a real childhood and access to education which brings them the opportunity to improve their lives. virtual adoption – a sponsorship program allowing children to go to school. fighting against hunger by running nutrition programs in schools and canteens. renovating classrooms, constructing new schools and buying schools equipment. Together with our volunteers we create new places where Malagasy kids can learn and play safely. volunteering program where international volunteers give language lessons organize sport, dance, arts and crafts classes. We achieve our goals with donations from individuals and business sponsors and with the important help of our volunteers. Together we shape the Foundation Ankizy Gasy-Children of Madagascar for a better future of many Malagasy kids. 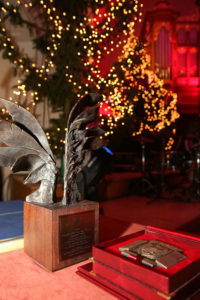 In January 2014 we were honored with the prestigious award from the state in the name of the late famous Polish journalist, photographer, poet and writer ‘Ryszard Kapuściński Award for doing good deeds’. Since 2013 we have been living in the small town Ambohidratrimo near the capital city Antananarivo where we are working together with our volunteers and Malagasy friends to ensure a better future for ‘our’ children. Our volunteer and project coordinator in Madagascar is Ony Rakotoarivelo who joined our organization in 2015.